Look no further for your Cardiologist than Dr. Sobolev. She is very knowledgeable, caring and thorough. I have seen severalcardiologists over the years and look forward to being treated byDr. Sobolev. Look no further for your Cardiologist than Dr. Sobolev. She is very knowledgeable, caring and thorough. I have seen several cardiologists over the years and look forward to being treatedbyDr. Sobolev. Dr Sonolov was on time, very thorough during appt. she is responsive to phone calls and questions in the portal. Highlyrecommend her. My husband sees her also and has been very thorough. Dr Sonolov was on time, very thorough during appt. she is responsive to phone calls and questions in the portal. Highly recommend her. My husband sees her also and has beenvery thorough. 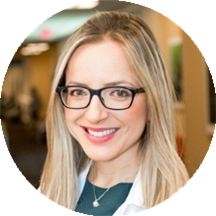 Maria Sobolev is a friendly and compassionate cardiologist caring for the New York, NY community. Dr. Sobolev earned her medical degree from the Ben-Gurion University of the Negev Faculty of Health Sciences in Israel in collaboration with Columbia University Medical Center. She completed her fellowship in cardiology and residency in internal medicine at the Albert Einstein College of Medicine of Yeshiva University. She completed her bachelor's at New York University. Dr. Sobolev is a part of Crystal Run Healthcare and is board certified by the American Board of Internal Medicine, Cardiovascular Disease (Internal Medicine), National Board of Echocardiography, Certification Board of Nuclear Cardiology. She is a member of the American College of Cardiology and the American Heart Association. She speaks English, Spanish, Russian, and Hebrew, which makes her accessible to patients from a variety of cultural backgrounds. During her consultations, Dr. Sobolev fully explains patients’ conditions and helps them choose an appropriate treatment plan. She treats a range of conditions, and she is eager to help the wider community receive the care they deserve. Martin Cohen MD Excellence in Training Award, Recognizes excellence in clinical care which includes an excellent bedside manner, superb clinical acumen and great compassion, June 7, 2016. Program Director’s Chief Fellow Award, Cardiology, Division of Cardiology, Albert Einstein College of Medicine/Montefiore Medical Center, July 2014- June 2016. First Place Winner, Albert Einstein College of Medicine/Montefiore Medical Center, Department of Medicine, Resident/Fellow Research Symposium, 2014. Dr. Sobolev was very helpful. She answered all my questions. I didn’t feel rushed at all. My appointment was on time with no waiting at all. Dr. Sobolev was very friendly and answered all my questions. She also set up a referral for sleep study for me immediately right from her office. I never had to seea cardiologist before but I will definitely return in the future if necessary. Dr. Maria Soboleva was very helpful and reassured me that for now there is nothing to worry about. Also recommended to see a neurologist - who was also pretty great. I keep trying to get my mom to switch to her. Plus she speaks Russian! This is now my second time with Dr. Sobolev. She is lovely, professional and has a very nice manner. She is very practical with her diagnosis and covers all bases. I am especially happy I can deal with a female professional. She was kind, thorough, and very professional. I highly recommend her. Please with the service I received! Dr. Sobolev is pleasant, smart, and professional. I am confident in her ability to diagnosis and treat cardiac issues with expertise. Dr. Sobolev is professional, articulate, pleasant, and helpful. Her explanations were detailed and easy to understand. Dr. Sobolev has a caring demeanor which is coupled with extensive knowledge.